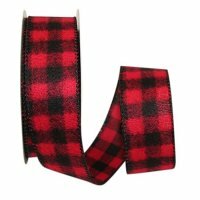 This year's version of our "Buffalo Check" ribbon is a rustic flannel with wired edges and is perfect for that "country" Christmas look. Our flannel ribbon with its "homespun" feel will add great charm to your "relaxed" decorating ideas. Imagine a "cabin-in-the-woods" theme, using our sensational large red/black "checkered" plaid, combined with pine boughs, white birch ornaments, and holly berries. You can let your imagination run wild and create a special warm and fuzzy holiday look with this great seasonal ribbon in a "go-with-everything" pattern.